Margaret Frances “Peg” Lynch was born in Lincoln Nebraska. She was a writer and actor, and creator of the radio and TV sitcom Ethel and Albert (pictured, with co-star Alan Bunce). She was one of the first women to star in, own, and write, singlehandedly, her own comedy series. In total, Lynch wrote nearly 11,000 scripts for radio and television. She died July 24 2015 at the ripe old age of 98. On this day in 1919, actor/director Norman Tokar was born in Newark, New Jersey. 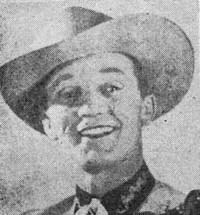 At the age of 22 he took over the starring role of Henry on NBC radio’s The Aldrich Family when Ezra Stone enlisted in 1942. In TV he directed the series Leave it to Beaver, Kilroy, The Chicago Teddy Bears, and 31 episodes of Disneyland. Tokar died April 6 1979. aged just 59. On this day in 1920, radio station WTAW of College Station, Texas, broadcast the first football play-by-play. Texas University beat Texas A&M, 7-3. Also this day in 1920, actor Ricardo Montalban was born in Mexico City. Probably best remembered as Mr. Roarke, the host on TV’s Fantasy Island, he also was featured in The Colby’s, and won an Emmy for his role in How the West was Won-Part II. His commercials for the “real corinthian leather” in the Chrysler Cordova were subject to spoofing by many impressionists & skit writers. He died of congestive heart failure Jan 14 2009 at age 88. 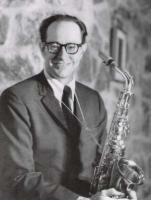 On this day in 1924, jazz saxophonist & composer Paul Desmond was born in San Francisco. He rose to prominence as a member of the Dave Brubeck Quartet in its heyday from 1951-67. He died May 30 1977 at age 52 from lung cancer. On this day in 1944, The FBI in Peace & War began a 14-year run on CBS Radio. The weekly crime drama was identified by its distinctive theme song, Prokofiev’s Love of Three Oranges, played to a martial beat. On this day in 1945, a spoof of the Gilbert and Sullivan classic, H.M.S. Pinafore, was broadcast on radio on NBC’s Fred Allen Show. The spoof was titled, The Brooklyn Pinafore. Joining actress Shirley Booth in the skit was baseball great Leo “The Lip” Durocher. On this day in 1947, Peggy Lee recorded her own composition (with Dave Barbour) and next #1 hit, “Manana (Is Soon Enough for Me).” Barbour directed the orchestra. On this day in 1948, the first TV station north of San Francisco & west of the Mississippi went on the air in Seattle, with only a handful of sets tuned to a High School football game shot by 2 cameras. The call sign was KRSC-TV for the first eight months, when the station became KING-TV after being purchased by Dorothy Bullitt. It was the only TV outlet in the Puget Sound for 4 years, and caused yagi antennas to spring from rooftops all over Vancouver & Victoria. On this day in 1949, “Rudolph, the Red-Nosed Reindeer” first appeared on the music charts and became THE musical hit of the Christmas season. Although Gene Autry‘s rendition is the most popular, 80 different versions of the song have been recorded, with nearly 20,000,000 copies sold. Also this day in 1949, famed tap dancer Bojangles Bill Robinson died of a chronic heart condition at 71. His films from the 1930’s with Shirley Temple were a staple of early TV. On this day in 1952, the No. 1 Billboard Pop Hit was “Why Don’t You Believe Me” by Joni James. On this day in 1955, “Rock Around the Clock” by Bill Haley and His Comets, after a summer at the top of the North American pop charts, became the #1 song in Great Britain. On this day in 1960, radio actors were put out of work when CBS radio axed five daytime serials from the airwaves. We said so long to The Second Mrs. Burton (after 14 years), Whispering Streets, Young Dr Malone & Right to Happiness (both after 21 years) and Ma Perkins (after 27 wonderful years.) In 1940, the high point for radio soap operas, there were as many as 45 on the air each day! Also this day in 1960, “Amos ‘n’ Andy” as played for over 30 years by Freeman Gosden and Charles Correll, made their last broadcast on the CBS Radio Network. On this day in 1961, the Everly Brothers were inducted into the U.S. Marine Corps Reserves, reporting for duty to Camp Pendleton, Calif.
On this day in 1965, the first color telecast of an NFL game aired on CBS. The Detroit Lions and the Baltimore Colts played to a 24-24 tie. On this day in 1966, the Jimi Hendrix Experience made their performance debut at the Bag O’ Nails Club in London. On this day in 1967, the song “Incense and Peppermints” by the Strawberry Alarm Clock topped the charts but only remained on top for a week. On this day in 1968, CBS-TV aired the music special “Francis Albert Sinatra Does His Thing.” Frank’s guests were Diahann Carroll and the 5th Dimension. Also in 1968, The Beatles double White album was released in the US. Featuring ‘Ob-La-Di, Ob-La-Da’, ‘Dear Prudence’, ‘Helter Skelter’, ‘Blackbird’ ‘Back In The USSR’ and George Harrisons ‘While My Guitar Gently Weeps’. The album spent 101 weeks on the Billboard chart peaking at No.1. On this day in 1969, John Lennon returned his MBE medal to the Queen to protest Britain’s support for U-S involvement to Vietnam, among other things. The other three Beatles kept their medals, which they received in 1965. On this day in 1971, Rolling Stone magazine quoted the surviving members of The Doors as saying they intended to continue on as a trio, despite the death of lead singer Jim Morrison. However they were only able to produce two lackluster albums before pulling the plug. On this day in 1975, beset by growing debt, Elvis Presley put up his Graceland estate as collateral to borrow $350,000 from the Memphis branch of the National Bank of Commerce. On this day in 1976, on Thanksgiving Day in San Francisco The Band made their final live concert performance. The show also featured Joni Mitchell, Dr John, Neil Young, Van Morrison, Neil Diamond, Eric Clapton and others. Martin Scorsese’s film of the event ‘The Last Waltz‘ later played to great critical acclaim. On this day in 1981, actor Jack Albertson, fondly remembered as “The Man” in the NBC-TV sitcom “Chico & the Man,” died of colon cancer at age 74. On this day in 1984, “Do They Know It’s Christmas?” – a benefit single that became the U.K.’s biggest single ever – was recorded in London by 36 artists including Paul McCartney, U2and Sting. More than $13.6 million was raised worldwide for Ethiopian relief. On this day in 1985, 17-year-old Bobby Brown announced his departure from The New Edition after 7 years, to launch a solo career. He didn’t mention that he’d been asked to leave. Jehane Benoit died at age 83. Madame Benoit gained fame nationally on CBC’s Take 30. On this day in 1988, having successfully completed their treatment at a drug rehab clinic in Arizona, Ringo Starr and his wife, actress Barbara Bach, flew back to England. On this day in 1989, the song “Blame It on the Rain” by Milli Vanilli topped the charts and stayed there for 2 weeks. On this day in 1991, San Francisco rock promoter Bill Graham died in a California helicopter crash at age 60. Also this day in 1991, actress Eleanor Audley died at age 86 of respiratory failure. She had a lively & lengthy career playing snobbish matrons in film & TV; she supplied the voice for Disney as a wicked stepmother in Cinderella & an evil fairy in Sleeping Beauty. But she is best remembered as Eddie Albert’s mother on TV’s Green Acres, despite being only a year older than him! On this day in 1995, at the top of U.S. pop-music charts were Whitney Houston‘s single, Exhale (Shoop Shoop) and the Alice in Chains‘ album, Alice in Chains. On this day in 1997, blues singer-guitarist Fenton Robinson died of complications from brain cancer at the age of 62. 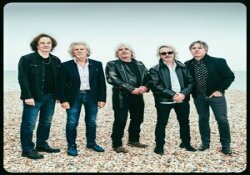 Also this day in 1997, the original lineup of the Zombies – Colin Blunstone, Rod Argent, Chris White, Hugh Grundy, and Paul Atkinson – played onstage together for the first time in 30 years. The reunited members performed their hits “She’s Not There” and “Time Of The Season” to a cheering crowd at London’s Jazz Cafe. Again in 1997, after much delay, Garth Brooks‘ seventh album “Sevens” was finally released. On this day in 1998, comedian/actor Flip Wilson succumbed to liver cancer at age 64. He was featured in TV’s Laugh In, and starred in his own two series, The Flip Wilson Show & Charlie and Company. Also in 1998, actor Michael J. Fox, who was then filming the third season of his ABC-TV sitcom “Spin City,” revealed he had Parkinson’s disease. Also this day in 1998, the final episode of “Babylon 5” aired, while elsewhere the first episode of “Powerpuff Girls” was broadcast. Again in 1998, Spin magazine editor Craig Marks told police that shock rocker Marilyn Manson’s bodyguards pinned him against a wall and hauled him up into the air. Marks claimed he was invited backstage to talk with Manson at New York’s Hammerstein Ballroom. Manson allegedly threatened Marks, “You know I can kill you, your family and everyone you know,'” Marks claimed. On this day in 2003, Glen Campbell was arrested in Phoenix with a blood alcohol level of .20 after his BMW struck a Toyota Camry. He was charged with ‘extreme’ drunk driving, hit and run, and assaulting an officer. A policeman reported that while in custody, Campbell hummed his hit ‘Rhinestone Cowboy’ repeatedly. On this day in 2005, the British-born (Prairie-raised) country entertainer Alberta Slim died in Surrey, B.C. at age 95. After singing on radio stations in Saskatchewan, he performed on CKNW’s Ranger’s Cabin from 1947 to ’52. Also in 2005, Madonna achieved her sixth number one on the Billboard album chart with ‘Confessions on a Dance Floor,’ her third consecutive US album chart topper. The album went to No.1 in 40 countries setting a new record. On this day in 2006, following a month of testing its new radio service with non-stop music from south Asia, Vancouver’s Radio Rhim Jim CHRJ AM 1200 officially signed on at 6:48 pm with programming for the south-Asian communities. On this day in 2007, Kevin Dubrow (below), the frontman with metal band ‘Quiet Riot,’ was found dead in his Las Vegas home of a cocaine overdose at age 52. Their 1983 release ‘Metal Health’ was the first metal album to top the US charts. Also this day in 2007, 45 years after its first Grey Cup, the CBC televised its last one, with TSN becoming the exclusive CFL carrier in 2008. On this day in 2008, the legal dispute over a music contract between Michael Jackson and an Arab sheik, ended with an “amicable settlement.” The King of Bahrain’s son, Sheikh Abdulla Bin Hamad Bin Isa Al-Khalifa, was suing Jackson for 8 million dollars, claiming he reneged on a music contract. Also in 2008, Rush’s DVD ‘Snakes & Arrows Live’ was released. The three-disc set featured high-definition footage from two ‘07 Rotterdam, Netherlands shows and an ‘08 concert in Atlanta. On this day in 2010, the documentary film The Beatles on Record premiered in the US on the History Channel. The show traced the band’s artistic growth. Also in 2010, at a concert in Auckland, U2 honored 29 miners killed in the Pike River, New Zealand, coal mine the day previous. During the song “One Tree Hill,” the names of the dead miners were scrolled across the big screens onstage. On this day in 2012, the Rolling Stones played the first of five arena dates celebrating their 50th anniversary. The London O2 concert featured appearances by former Stones Bill Wyman and Mick Taylor. Also in 2012, a memorial fund marathon was run in Seattle in honor of the late Alice In Chains frontman Layne Staley. On this day in 2013, Foreststorn “Chico” Hamilton, an influential jazz drummer and bandleader who was an architect of the West Coast cool jazz style and played with the likes of Charles Mingus and Chet Baker, and was also known for discovering young talent, died at age 92. Also in 2013, Yahoo! announced it had hired Katie Couric as Global Anchor of Yahoo! News. Couric debuted in the new role on January 13, 2014, in an interview with former U.S.Secretary of Defense Robert Gates (above). On this day in 2014, drummer Shawn Drover quit Megadeth after a ten year tenure. His announcement came a day before guitarist Chris Broderick also bailed on Megadeth. 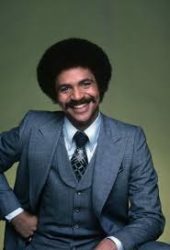 On this day in 2016, actor Ron Glass, who effortlessly radiated an easygoing charm playing debonair detective Ron Harris on ABC-TV’s Barney Miller (1975-82), died of respiratory failure at age 71. On this day in 2017, actor Rance Howard, the father of actor/director Ron Howard and his younger acting brother Clint, who played supporting roles on the big and small screen for nearly 50 years, died at age 89 due to heart failure spurred on by a West Nile virus infection. Actor Jack Hogan (Combat, Adam 12, Sierra) is 89. Actress Kathryn Crosby (Bing’s widow) (Ford Television Theatre, Cyrano de Bergerac) is 85. Actor Matt Clark (Jeff Foxworthy Show) is 82. Ontario-born Vancouver radio Home Repair advisor Shell Busey is 76. Author, actor and game show host Ben Stein (Win Ben Stein’s Money) is 75. Singer Bob Lind is 75. Actor Tracey Walter (Reno 911, Nash Bridges) is 72. Actor John Larroquette (Night Court, John Laroquette Show, Boston Legal) is 71. Actor/voicist Bruce Hopkins (Power Rangers Ninja Storm, Hercules: The Legendary Journeys) is 63. “Dancing With the Stars” judge Bruno Tonioli is 63. Actress Darlanne Fluegel (Hunter, Crime Story) is 60. Singer Amy Grant is 58. Halifax-born jazz singer Holly Cole is 55. Television personality Sonja Morgan (The Real Housewives of New York City) is 55. Actor Kevin Chamberlin (Jessie) is 55. Rock musician Eric Grossman (K’s Choice) is 54. Rock singer Mark Lanegan (Queens of the Stone Age and Screaming Trees) is 54. Actor Dougray Scott (Hemlock Grove, Desperate Housewives) is 53. Bellingham-born actor Billy Burke (Zoo, Revolution, Wonderland, My Boys) is 52. Singer Stacy Lattisaw is 52. Rock musician Rodney Sheppard (Sugar Ray) is 52. Actor John Lehr (Quick Draw, 10 Items or Less, Jesse) is 51. Actor Gregg Turkington (Gravity Falls) is 51. Rapper-producer Erick Sermon is 50. Edmonton-born actress Jill Hennessy (Madam Secretary, Luck, Crossing Jordan, Law & Order) is 49. Actress Christina Applegate (Up All Night, Married with Children) is 47. Actor Eddie Steeples (My Name Is Earl) is 45. Vancouver-born actress Stefanie von Pfetten (Cracked) is 44. Actor Kristian Nairn (Game of Thrones) is 43. Toronto-born actor Kenneth Mitchell (Astronaut Wives Club, Switched at Birth, Ghost Whisperer) is 43. TV football analyst/former quarterback Donovan McNabb is 41. Actress Jill Flint (Royal Pains, The Night Shift, The Good Wife) is 40. Actor Jerry Ferrara (Entourage) is 39. Actor Joel Kinnaman (The Killing, House of Cards) is 38. Actress Valerie Azlynn (Sullivan & Son, The Joe Schmo Show) is 37. NBC-TV news correspondent Jenna Bush (Today) is 36. Actress Natalia Cordova-Buckley (Agents of S.H.I.E.L.D.) is 35. Actress Haley Webb (Teen Wolf) is 32. Actress Katie Cassidy (Arrow, Melrose Place 2009) is 31. Actor Cole Escola (Difficult People, Jeffery & Cole Casserole) is 31. Actor Jordan Lawson (Power Trip, LG15: The Resistance) is 29. Actor Stephen Lunsford (Kamen Rider:Dragon Knight) is 28. Siner/songwriter/actress Jamie Grace is 27. Actor Zack Shada (Jane Doe TV movies) is 25. Actor Cameron Moulène (Raising Hope, Happyland) is 24.